I read this article and found it very interesting, thought it might be something for you. The article is called Campaign Manager’s news: protesting bigots, defending unions, and more and is located at https://votesocialism.com/campaign-managers-news-protesting-bigots-defending-unions-and-more/. Last Sunday, after picketing the fascists in downtown Seattle, Steve and I went to one of his favorite pubs for a beer, the Slow Boat Tavern in the Hillman City neighborhood of Seattle. “Hey, Steve,” says Ken, the owner, as we walk in. Another patron walks up to the bar. “Hey, Steve,” they say before ordering a beer. While we drink our beers, Ken plots a fund-raiser with us and notes that he needs more of Steve’s campaign cards at the bar. He’s already run out of them. And while support from pub patrons and owners may not appear to be a good endorsement to some, it is Steve’s salt-of-the-earth, no-nonsense, down-home, working-person heart-of-gold that people appreciate. Here’s the update from the campaign this week, from fighting bigots to drinking beer. 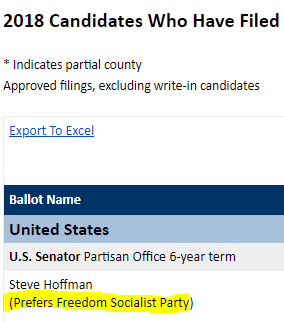 Steve’s party preference on the ballot will include a space! As mentioned last week, Washington state has a 16-character limit for the party name for U.S. Senate candidates. “Freedom Socialist” with a space between the two words is 17 characters. When we initially filed we mashed the two words together. But we also requested a waiver from the 16-character rule because it discriminates against third parties. Our request for a waiver was granted! The screen shot to the right now shows a space. As mentioned above, Steve and campaign volunteers marched against the alt-right at the “Stand up for human rights! Picket against bigotry, white supremacy and fascism”. Over 60 demonstrators built a disciplined, militant and loud protest that out-chanted the ultra-right followers of Joey Gibson and Patriot Prayer. Several groups organized and endorsed the action including Freedom Socialist Party, the Party for Socialism and Liberation, Radical Women, Vets for Peace, and Seattle Gay News. The campaign will continue to fight against the rising tide of reaction in Washington. More photos here. 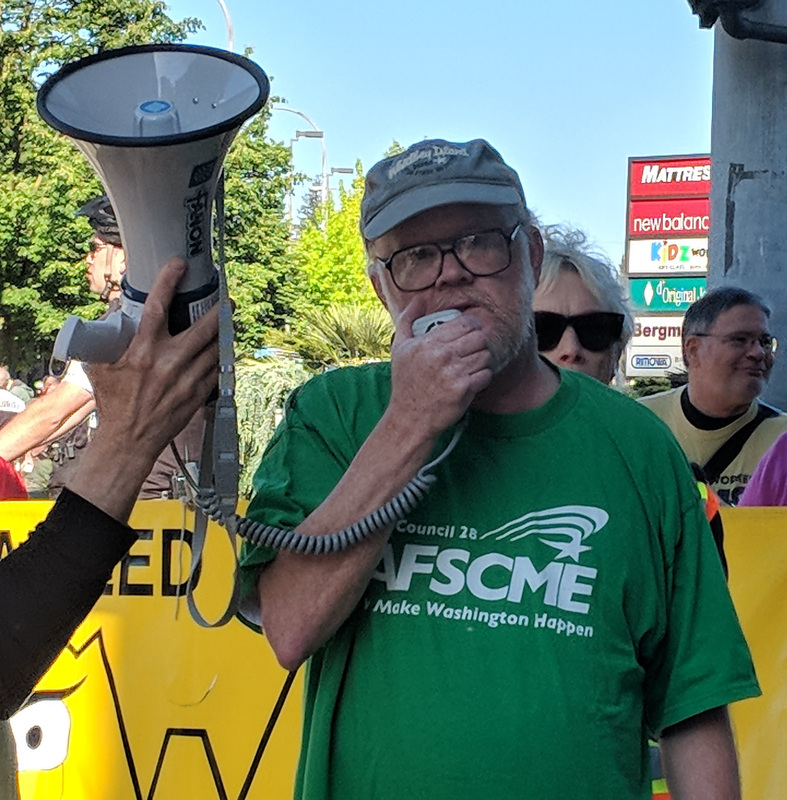 Two days later, over 20 unions and community groups came together to give Mark Janus and the Washington Policy center an unwelcome in Bellevue. Janus, an anti-union public employee from Illinois, is the lead plaintiff in the Janus vs AFSCME “right-to-work” lawsuit which is currently before the U.S. Supreme court. He was a speaker at the conservative think-tank’s “Solutions Summit”. The picket was sponsored by Organized Workers for Labor Solidarity (OWLS) and included fired-up workers from a wide variety of jobs and trades. You can view photos on the OWLS Facebook page. Next week, Steve will be in Olympia to tape the Video Voters Guide. This guide begins airing in June. Mark your calendars for Thursday, June 14. That’s Steve Hoffman Day at Slow Boat Tavern. Ken is honoring Steve with a contribution himself and then we’ll have a Pub Party from 6:00 p.m. to 10:00 p.m. with pizza and peanuts. Bring your credit or debit card because Slow Boat doesn’t do cash. The campaign has postcards, brochures and yard signs that need to get into people’s hands, windows and yards! Could you help? Below are some scheduled events you can attend. We can also mail or deliver materials to you for distribution at your neighborhood stores, farmers markets, and street fairs. Volunteers will campaign at Folklife Festival this weekend; call 206-722-2453 for times and locations. 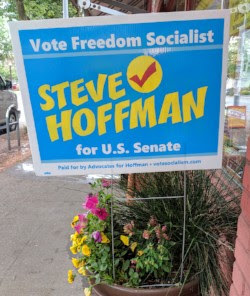 This week’s Volunteer Night, Wednesday, May 30, 6:00pm to 8:00pm, will feature campaigning at stores and markets, plus button making and Facebooking for Hoffman. Want to help with office work or research? Call me at 206-722-2453. We are overflowing with opportunities! 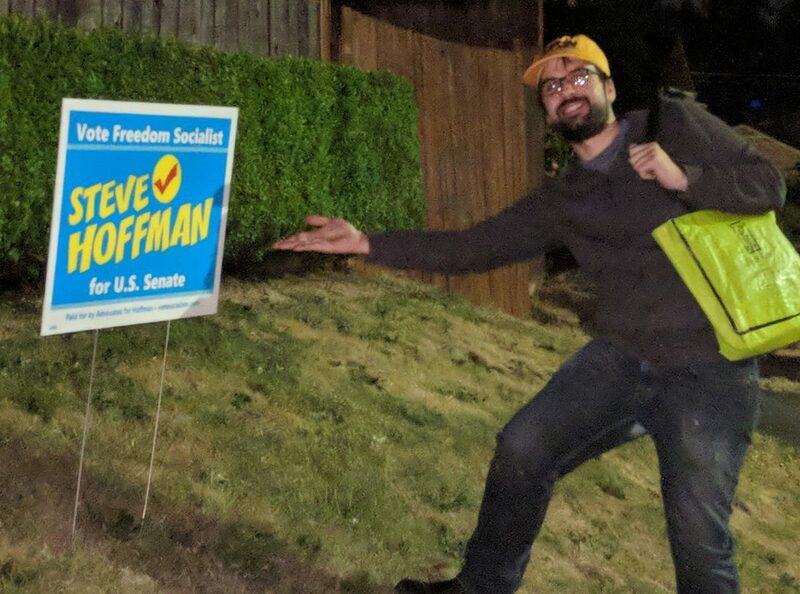 Do you want a yard sign? Click here and we’ll get one delivered to you. “All mail is good mail,” the mail person says. To me, good mail includes envelopes with campaign contributions and this week was a great week, with checks arriving every day! Keep them coming or give online. That’s it for this week. Send me your thoughts and ideas.